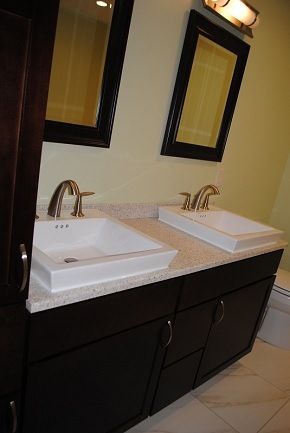 Bathroom Ideas | Northtowns Remodeling Corp. The heavy glass enclosure keeps the beautiful porcelain tile on display while also keeping the shower from overpowering the room. This remodeled bathroom offers the best of both worlds. Just steps away from the luxurious soaking tub is a glamorous shower. The heavy glass enclosure keeps the beautiful porcelain tile on display while also keeping the shower from overpowering the room. The subtle change in tile direction in the tile inset helps to maintain a classic appearance without being overdone. The molded acrylic soaker tub sits serenely in the corner. Just because a bath, shower, or combination of the two is functional, doesn’t mean it can’t be fabulous. Our collection of products are blended together to produce quality added value. Future proof your home while maintaining your own personal style. Personalize your project with a wide range of colors. Take curbless design to the next level. 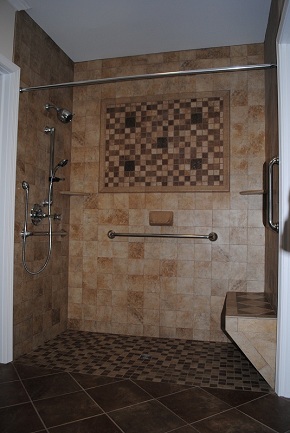 Accessible and universal designed showers are typically more practical than fabulous - until now. Future proof your home while maintaining your own personal style. Personalize your project with a wide range of colors. Go subtle or bold, either way; it doesn’t have to be boring. Cabinetry transforms bare and plain into a beautiful storage area. Cabinets can be the perfect solution to many storage needs in your . Our wide selections let your creativity reign. Cabinetry transforms bare and plain into a beautiful storage area. Make the most of any space, that's both smart, and stylish. New vanity sizes accommodate people with different heights; no more deep bending to wash your face! Help prepare for the future, without intruding on your lifestyle today. This simple but spacious neo angle shower is made of a standard acrylic base with an Avonite wall surround. High quality acrylic is durable and can be molded into different shapes. 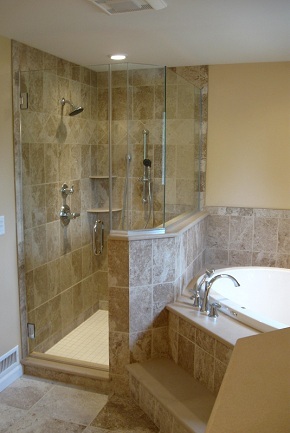 Even a bathroom of modest dimensions can accommodate a neo angle shower. Space saving doors include fixed panels on either side of the door and are ideal for a smaller bathroom. This space saving corner design is built with shelves and the glass enclosure keeps the shower from overpowering the room. 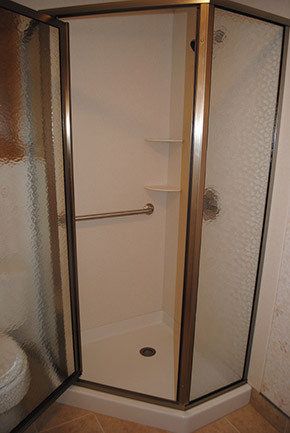 Placing a grab bar in a strategic place in a shower and installing lever style faucets provide for a universal design. While planning your bathroom, why not incorporate some ease of use Benefits. Help prepare for the future, without intruding on your lifestyle today.